This is a longer day trip but worth every kilometre, taking in some of New Zealand’s most iconic sights, delighting millions of people every year. The journey there takes you through the forest clad mountains of the Lewis Pass. You’ll pass through Reefton – a charming small town that was the first place in New Zealand to have a public supply of electricity. Take the southern route towards Greymouth and now it’s time to check when is the next high tide. Ideally you want to arrive at Punakaiki towards the high tide, when the waves are at their highest and blow water spouts up through the holes in the rocks. The time of the tide may help you decide if you’ve time to see Shanty town now or if you’ll double back later. 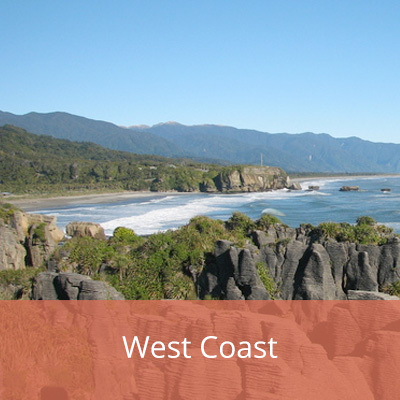 It is very much worth stopping at the old gold mining town of Shanty town, near Greymouth, for a trip back in time complete with a steam train and gold panning. Here you can see how they lived in the rough times of early days (1850-1910 is not that long ago) including a hospital, fire station, school, shops and movie theatre. Driving north you’ll get a good view of the thundering Pacific Ocean on your lefthand side, the rainforest and iconic nikau palms on the right. Stop for a while at Punakaiki for the walk out amongst the “pancake rocks” where you can hear and feel the boom of the waves hitting the rocks and whooshing up into the air. Heading back home, continue north until you reach the beach and headland of Cape Foulwind where you can come quite close to the seal colony there. Turning inland once again, follow up the Buller River Gorge. When you get to Inangahua Junction, if you’ve time to take a little longer drive, continue east along the Upper Buller Gorge (imagine doing it in a horse drawn coach), stopping for a walk at the swing bridge across the river, then head south back to Springs Junction and then towards “home”. For the shorter route, at Inangahua Junction head south back via Reefton to “home”. Now it’s time to relax in Hanmer Springs’ thermal hot pools to soak and reflect on the day.